Relentless Goat Productions, 9780996350440, 184pp. Geeks & Greeks is Good Will Hunting meets Animal House in graphic novel format. In this high-tech battle royale two of MIT's smartest students square off in an escalating war of pranks and egos. Jim Walden is an underachieving freshman with a knack for mischief and a secret that could end his career before it begins. Luke Bardolf is a gruff alpha-nerd senior on a mission to pull the ultimate prank and maintain dominance over his fraternity. When their rivalry comes to a head, it will take all of Jim's creativity and resourcefulness to save his scholarship, his friendships, his girlfriend, and his dream of becoming an astronaut. 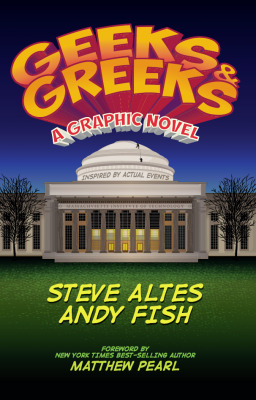 Geeks & Greeks was written by humorist Steve Altes and is based on MIT's world-famous hacking culture and real-life hazing incidents Altes witnessed as an MIT student. At MIT a hack is a clever, humorous, technically sophisticated prank, such as building a life-size campus police car replica atop the Institute's 150-foot-high "Great Dome" under the cover of night. This extensively researched 184-page coming-of-age story includes over 100 endnotes providing colorful background details on true aspects of the story as well as revealing numerous Easter eggs which will delight readers of all stripes. These endnotes divulge the many scientific, literary, and pop cultural allusions the creators have embedded in the graphic novel. How many graphic novels can make jokes out of Schubert's last symphony, Archimedes' Principle, supernovas, cryogenics, kinematic viscosity, Shakespearean characters, and Einstein's theory of relativity and still keep things fully accessible to the general public? According to Steve Altes, "You don't need to be a genius to understand Geeks & Greeks, but you'll feel like a genius after you read it." Geeks & Greeks explores many themes that are relevant to techies, college students, and fans of young adult literature: geek as hero, hazing, college pranks as a form of civil disobedience or performance art, Emersonian notions of self-reliance and non-conformism ("imitation is suicide"), role of mischief-making in male bonding, and credentialism (raw talent vs. institutional pedigree). Reviewers are hailing Geeks & Greeks. Jon B. Cooke, editor of Comic Book Artist magazine says, "Geeks & Greeks is a gonzo-brilliant visual feast that reads like a blizzard of engrossing frenetic activity, offering an ethnographic deep-dive into MIT hacking and hazing subcultures. Geeks & Greeks combines the high-brow intelligence of Good Will Hunting with the rowdy frat antics of Animal House and the heart of Dead Poets Society. There is barely a moment to breathe as this roller coaster careens through the worlds of high-tech hazing, devilishly original pranks, and swaggering intellectual one-upmanship. Fish's masterful illustrations leap off the page with their inspired perspectives and vibrant colors." MIT insiders praise the story's realism and authenticity. Karl Iagnemma, MIT research scientist and author of On the Nature of Human Romantic Interaction, says, "As someone who's been walking MIT's hallways for the past 20 years, I can attest that Steve Altes has tuned into the Institute's quirky frequency, the raucous and rigorous spirit of the place. Read Geeks & Greeks for its hot fusion of wit, narrative, and imagery." "A gonzo-brilliant visual feast that reads like a blizzard of engrossing frenetic activity, offering an ethnographic deep-dive into MIT hacking and hazing subcultures. Geeks & Greeks combines the high-brow intelligence of Good Will Hunting with the rowdy frat antics of Animal House and the heart of Dead Poets Society. There is barely a moment to breathe as this roller coaster careens through the worlds of high-tech hazing, devilishly original pranks, and swaggering intellectual one-upmanship. Fish's masterful illustrations leap off the page with their inspired perspectives and vibrant colors." "As someone who's been walking MIT's hallways for the past 20 years, I can attest that Steve Altes has tuned into the Institute's quirky frequency, the raucous and rigorous spirit of the place. Altes speaks geek so fluently you'd mistake him for a jaded postdoc. Read Geeks & Greeks for its hot fusion of wit, narrative, and imagery. Awesomeness to the nth degree." MIT research scientist and author of "On the Nature of Human Romantic Interaction"
"Geeks & Greeks is a crackling insider look into the world of MIT fraternities. If you've ever wanted to peek behind the doors where young geniuses hack and haze, let whip-smart Steve Altes be your guide." MIT alum and co-creator of "Dharma & Greg" and "Caroline in the City"
"A graphic novel replete with action sequences might seem an odd medium for a tale about one of the brainiest places on Earth, but after a few pages I was hooked. With Geeks & Greeks Altes and Fish have achieved something remarkable – they have captured the energy and quirkiness that are the hallmarks of MIT. Unless you're performing pediatric neurosurgery, stop whatever you're doing and read this book." "Andy Fish's meticulously faithful illustrations and Steve Altes's disarming humor bring to life a more-fact-than-fiction adventure." MIT alum and author of "Consulting Demons: Inside the Unscrupulous World of Global Corporate Consulting"